Reading and share top 15 famous quotes and sayings about Cooking And Love by famous authors and people. Browse top 15 famous quotes and sayings about Cooking And Love by most favorite authors. 1. "The same chemicals were used in the cooking as were used on the composition of her own being: only those which caused the most violent reaction, contradiction, and teasing, the refusal to answer questions but the love of putting them, and all the strong spices of human relationship which bore a relation to black pepper, paprika, soybean sauce, ketchup and red peppers." 2. "I want to marry you, Malda - because I love you - because you are young and strong and beautiful - because you are wild and sweet and - fragrant, and - elusive, like the wild flowers you love. Because you are so truly an artist in your special way, seeing beauty and giving it to others. I love you because of all of this, because you are rational and highminded and capable of friendship - and in spite of your cooking! ""But - how do you want to live? ""As we did here - at first," he said. "There was peace, exquisite silence. There was beauty - nothing but beauty. There were the clean wood odors and flowers and fragrances and sweet wild wind. And there was you - your fair self, always delicately dressed, with white firm fingers sure of touch in delicate true work. I loved you then." 3. "Cooking is great, love is grand, but souffles fall and lovers come and go. But you can always depend on a book!" 4. "Cooking is at once child's play and adult joy. And cooking done with care is an act of love." 6. 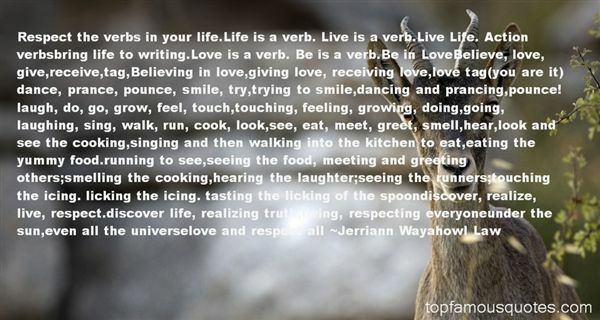 "Respect the verbs in your life.Life is a verb. Live is a verb.Live Life. Action verbsbring life to writing.Love is a verb. Be is a verb.Be in LoveBelieve, love, give,receive,tag,Believing in love,giving love, receiving love,love tag(you are it)dance, prance, pounce, smile, try,trying to smile,dancing and prancing,pounce!laugh, do, go, grow, feel, touch,touching, feeling, growing, doing,going, laughing, sing, walk, run, cook, look,see, eat, meet, greet, smell,hear,look and see the cooking,singing and then walking into the kitchen to eat,eating the yummy food.running to see,seeing the food, meeting and greeting others;smelling the cooking,hearing the laughter;seeing the runners;touching the icing. licking the icing. tasting the licking of the spoondiscover, realize, live, respect.discover life, realizing truth,living, respecting everyoneunder the sun,even all the universelove and respect all"
7. "My hobbies are cooking and gardening, especially growing orchids. I love soccer, my husband and I support a British team called Chelsea, and I also enjoy tennis. We have 3 cats." 8. "I'll keep it," she said. "Then, when you get back, after you and the dark one are done making out and planning a future filled with blond-haired, green-eyed, pigment-challeneged rug rats, I'll bring it over and you can add it to your scrapbook, right before you start cooking me dinner. 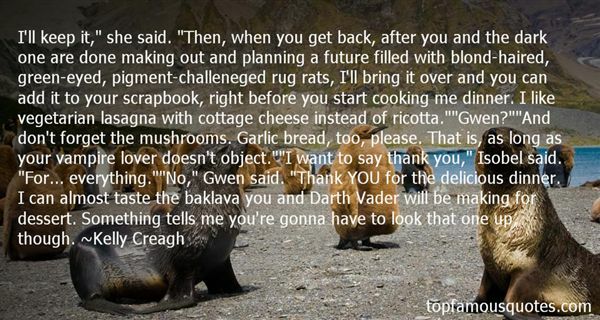 I like vegetarian lasagna with cottage cheese instead of ricotta.""Gwen? ""And don't forget the mushrooms. Garlic bread, too, please. That is, as long as your vampire lover doesn't object. ""I want to say thank you," Isobel said. "For... everything. ""No," Gwen said. "Thank YOU for the delicious dinner. I can almost taste the baklava you and Darth Vader will be making for dessert. Something tells me you're gonna have to look that one up, though." 9. "I'm always in the kitchen, cooking and experimenting - I love it. And every now and then I think, 'I should write a cookbook' or, 'I should write for food magazines.' And then I get drawn back to writing fiction again." 10. "Like many men, I am not ashamed to admit that my principal joys are domestic. I love cooking, and I love looking after my children. Indeed, the times that I have with them are the only ones when I feel unconditionally happy." 11. "How to announce the return of comfort and well-being except by cooking something fragrant. That is what her mother always did. After every calamity of any significance she would fill the atmosphere of the house with the smell of cinnamon rolls or brownies, or with chicken and dumplings, and it would mean, This house has a soul that loves us all, no matter what. It would mean peace if they had fought and amnesty if they had been in trouble. It had meant, You can come down to dinner now, and no one will say a thing to bother you, unless you have forgotten to wash your hands. And her father would offer the grace, inevitable with minor variations, thanking the Lord for all the wonderful faces he saw around his table." 12. "And Father said, "Christopher, do you understand that I love you? "And I said "Yes," because loving someone is helping them when they get into trouble, and looking after them, and telling them the truth, and Father looks after me when I get into trouble, like coming to the police station, and he looks after me by cooking meals for me, and he always tells me the truth, which means that he loves me." 13. "My mother was a wonderful, wonderful woman with a lovely voice who hated housework, hated cooking even more and loved her children. She was always arranging church activities such as a bazaar." 14. "It may also be that, quite apart from any specific references one food makes to another, it is the very allusiveness of cooked food that appeals to us, as indeed that same quality does in poetry or music or art. We gravitate towards complexity and metaphor, it seems, and putting fire to meat or fermenting fruit and grain, gives us both: more sheer sensory information and, specifically, sensory information that, like metaphor, points away from the here and now. This sensory metaphor - this stands for that - is one of the most important transformations of nature wrought by cooking. And so a piece of crisped pig skin becomes a densely allusive poem of flavors: coffee and chocolate, smoke and Scotch and overripe fruit and, too, the sweet-salty-woodsy taste of maple syrup on bacon I loved as a child. As with so many other things, we humans seem to like our food overdetermined." 15. "We could see other fires--great leaping bonfires as well as cooking fires--all the way down the beach to the twinkling metropolis of Joyland. They made a lovely chain of burning jewelry. Such fires are probably illegal in the twenty-first century; the powers that be have a way of outlawing many beautiful things made by ordinary people. I don't know why that should be, I only know it is." New Rule: There's only one thing to say about the Christian Film and Television Commission giving me the Bigoted Bile Award and naming Religulous the number-one Most Unbearable Movie of 2008: Thank you! You hate me, you really hate me!"